In a shallow bowl, soak the bread cubes in enough water to cover. Remove the bread cubes and squeeze by hand to wring excess moisture. In a large bowl, combine the bread, beef, eggs, garlic, pecorino, parsley, pine nuts, salt and pepper and mix by hand to incorporate bread into meat. 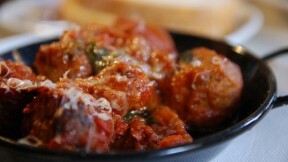 With wet hands, form the mixture meatballs, each about the size of a golf ball. In a large, heavy-bottomed skillet, head the oil until almost smoking. Add the meatballs, working in batches if necessary to avoid overcrowding the pan, and cook until deep golden brown on all sides, about 10 minutes per batch. Serve warm or at room temperature.